"Tower Block" and "High-rise" redirect here. For the film, see Tower Block (film). For other uses, see High Rise (disambiguation). 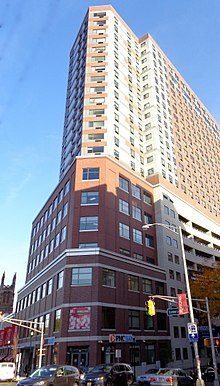 One of multiple newer high-rise towers in Downtown New Brunswick, New Jersey, U.S., a cultural and educational district undergoing gentrification. A high-rise building is a tall building, as opposed to a low-rise building and is defined by its height differently in various jurisdictions. It is used as a residential, office building, or other functions including hotel, retail, or with multiple purposes combined. Residential high-rise buildings are also known as tower blocks and may be referred to as "MDUs", standing for "multi-dwelling unit". A very tall high-rise building is referred to as a skyscraper. High-rise buildings became possible with the invention of the elevator (lift) and less expensive, more abundant building materials. The materials used for the structural system of high-rise buildings are reinforced concrete and steel. Most North American style skyscrapers have a steel frame, while residential blocks are usually constructed of concrete. There is no clear difference between a tower block and a skyscraper, although a building with fifty or more stories is generally considered a skyscraper. High-rise structures pose particular design challenges for structural and geotechnical engineers, particularly if situated in a seismically active region or if the underlying soils have geotechnical risk factors such as high compressibility or bay mud. They also pose serious challenges to firefighters during emergencies in high-rise structures. New and old building design, building systems like the building standpipe system, HVAC systems (heating, ventilation and air conditioning), fire sprinkler system and other things like stairwell and elevator evacuations pose significant problems. Studies are often required to ensure that pedestrian wind comfort and wind danger concerns are addressed. In order to allow less wind exposure, to transmit more daylight to the ground and to appear more slender, many high-rises have a design with setbacks. Apartment buildings have technical and economic advantages in areas of high population density, and have become a distinctive feature of housing accommodation in virtually all densely populated urban areas around the world. In contrast with low-rise and single-family houses, apartment blocks accommodate more inhabitants per unit of area of land and decrease the cost of municipal infrastructure. Emporis Standards defines a high-rise as "A multi-story structure between 35–100 meters tall, or a building of unknown height from 12–39 floors." According to the building code of Hyderabad, India, a high-rise building is one with four floors or more, or 15 to 18 meters or more in height. The New Shorter Oxford English Dictionary defines a high-rise as "a building having many storeys". The International Conference on Fire Safety in High-Rise Buildings defined a high-rise as "any structure where the height can have a serious impact on evacuation"
In the U.S., the National Fire Protection Association defines a high-rise as being higher than 75 feet (23 meters), or about 7 stories. Most building engineers, inspectors, architects and similar professionals define a high-rise as a building that is at least 75 feet (23 m) tall. High-rise apartment buildings had already appeared in antiquity: the insulae in ancient Rome and several other cities in the Roman Empire, some of which might have reached up to ten or more stories, one reportedly having 200 stairs. Because of the destruction caused by poorly built high-rise insulae collapsing, several Roman emperors, beginning with Augustus (r. 30 BC – 14 AD), set limits of 20–25 meters for multi-story buildings, but met with limited success, as these limits were often ignored despite the likelihood of taller insulae collapsing. The lower floors were typically occupied by either shops or wealthy families, while the upper stories were rented out to the lower classes. Surviving Oxyrhynchus Papyri indicate that seven-story buildings even existed in provincial towns, such as in third century AD Hermopolis in Roman Egypt. In Arab Egypt, the initial capital city of Fustat housed many high-rise residential buildings, some seven stories tall that could reportedly accommodate hundreds of people. Al-Muqaddasi, in the 10th century, described them as resembling minarets, while Nasir Khusraw, in the early 11th century, described some of them rising up to 14 stories, with roof gardens on the top story complete with ox-drawn water wheels for irrigating them. By the 16th century, Cairo also had high-rise apartment buildings where the two lower floors were for commercial and storage purposes and the multiple stories above them were rented out to tenants. The skyline of many important medieval cities was dominated by large numbers of high-rising urban towers, which fulfilled defensive but also representative purposes. The residential Towers of Bologna numbered between 80 and 100 at a time, the largest of which still rise to 97.2 m. In Florence, a law of 1251 decreed that all urban buildings should be reduced to a height of less than 26 m, the regulation immediately put into effect. Even medium-sized towns such as San Gimignano are known to have featured 72 towers up to 51 m in height. The Hakka people in southern China have adopted communal living structures designed to be easily defensible in the forms of Weilongwu (围龙屋) and Tulou (土楼), the latter are large, enclosed and fortified earth building, between three and five stories high and housing up to 80 families. The oldest still standing tulou dates back from the 14th century. High rises were built in the Yemeni city of Shibam in the 16th century. The houses of Shibam are all made out of mud bricks, but about five hundred of them are tower houses, which rise five to sixteen stories high, with each floor having one or two apartments. This technique of building was implemented to protect residents from Bedouin attacks. While Shibam has existed for around two thousand years, most of the city's houses date from the 16th century. The city has the tallest mud buildings in the world, some more than 30 meters (100 feet) high. Shibam has been called "one of the oldest and best examples of urban planning based on the principle of vertical construction" or "Manhattan of the desert". Currently, the tallest high-rise apartment building in the world is Chicago's John Hancock Center, constructed under the supervision of Skidmore, Owings & Merrill and completed in 1969. The building has 100 stories and stands 344 meters tall. A residential block in Steinfurt, Westphalia, Germany, forming a "Y"
The residential tower block with its typical concrete construction are a familiar feature of Modernist architecture. Influential examples include Le Corbusier's "housing unit" his Unité d'Habitation, repeated in various European cities starting with his Cité radieuse in Marseille (1947–52), constructed of béton brut, rough-cast concrete, as steel for framework was unavailable in post-war France. Residential tower blocks became standard in housing urban populations displaced by slum clearances and "urban renewal". High-rise projects after World War II typically rejected the classical designs of the early skyscrapers, instead embracing the uniform international style; many older skyscrapers were redesigned to suit contemporary tastes or even got demolished - such as New York's Singer Building, once the world's tallest skyscraper. However, with the movements of Postmodernism, New Urbanism, and New Classical Architecture, that established since the 1980s, a more classical approach came back to global skyscraper design, that is popular today. Other contemporary styles and movements in highrise design include organic, sustainable, neo-futurist, structuralist, high-tech, deconstructivist, blob, digital, streamline, novelty, critical regionalist, vernacular, Neo Art Deco, and neo-historist, also known as revivalist. Residential tower complexes are common in Asian countries such as China, India, Indonesia, Taiwan, Singapore, Japan, Pakistan, and South Korea, as urban densities are very high. In Singapore and urban Hong Kong, land prices are so high that a large portion of the population lives in high-rise apartments. In fact, over 60% of Hong Kong residents live in apartments, many of them condominiums. Sarah Williams Goldhagen (2012) celebrated the work of innovative architecture firms such as WOHA (based in Singapore), Mass Studies (based in Seoul), Amateur Architecture Studio (based in Hangzhou, China), and the New York City-based Steven Holl in the transformation of residential towers into "vertical communities" or "vertical cities in the sky" providing aesthetic, unusually designed silhouettes on the skyline, comfortable private spaces and attractive public spaces. None of these "functional, handsome, and humane high-rise residential buildings" are affordable housing. In South Korea, the tower blocks are called Apartment Complex (아파트 단지). The first residential towers began to be built after the Korean War. The South Korean government needed to build many apartment complexes in the cities to be able to accommodate the citizens. In the 60 years since, as the population increased considerably, tower blocks have become more common. This time, however, the new tower blocks integrated shopping malls, parking systems, and other convenient facilities. Samsung Tower Palace in Seoul, South Korea, is the tallest apartment complex in Asia. In Seoul, approximately 80% of its residents live in apartment complexes which comprise 98% of recent residential construction. Seoul proper is noted for its population density, eight times greater than Rome, though less than Manhattan and Paris. Its metropolitan area is the densest in the OECD. Renovated apartment building from 1963 in Bucharest, Romania. With the 2010s, renovation of older apartment buildings in Eastern Europe has become common, especially in countries which get EU funds. Although some Central and Eastern European countries during the interwar period, such as the Second Polish Republic, already started building housing estates that were considered to be of a very high standard for their time, many of these structures perished during the Second World War. In the Eastern Bloc, tower blocks were constructed in great numbers to produce plenty of cheap accommodation for the growing postwar populations of the USSR and its satellite states. This took place mostly in the 1950s, 1960s and 1970s of the 20th century, though in the People's Republic of Poland this process started even earlier due to the severe damages that Polish cities sustained during World War II. Throughout the former Eastern Bloc countries, tower blocks built during the Soviet years make up much of the current housing estates and most of them were built in the specific socialist realist style of architecture that was dominant in the territories east of the Iron Curtain. In Romania, the mass construction of standardized housing blocks began in the 1950s and 1960s with the outskirts of the cities, some of which were made up of slums. Construction continued in the 1970s and 1980s, under the systematization programme of Nicolae Ceaușescu, who, after a 1971 visit in North Korea, was impressed by the Juche ideology of that country. [dubious – discuss] Systematization consisted largely of the demolition and reconstruction of existing villages, towns, and cities, in whole or in part, in order to build blocks of flats (blocuri). In Czechoslovakia (now the Czech Republic and Slovakia), panelák building under communism resulted from two main factors: the postwar housing shortage and the ideology of communist Czechoslovak leaders. In Eastern European countries, opinions about these buildings vary greatly, with some deeming them as eyesores on their city's landscape while others glorify them as relics of a bygone age. Since the dissolution of the Soviet Union, and especially in the late 1990s and early 2000s, many of the former Eastern Bloc countries have begun construction of new, more expensive and modern housing. The Śródmieście borough of Warsaw, the capital of Poland, has seen the development of an array of skyscrapers. Russia is also currently undergoing a dramatic buildout, growing a commercially shaped skyline. Moreover, the ongoing changes made to postwar housing estates since the 2000s in former communist countries vary - ranging from simply applying a new coat of paint to the previously grey exterior to thorough modernization of entire buildings. In the European Union, among former communist states, a majority of the population lives in flats in Latvia (65.1%), Estonia (63.8%), Lithuania (58.4%), Czech Republic (52.8%), and Slovakia (50.3%) (as of 2014[update], data from Eurostat). However, not all flat dwellers in Eastern Europe live in communist era blocks of flats; many live in buildings constructed after the fall of communism, and some in buildings surviving from the era before communism. In Western Europe, there are fewer high-rise buildings because of the historic city centers. In the 1960s, people started demolishing a few old buildings to replace them with modern high buildings. In Brussels, the capital of Europe, there are numerous modern high-rise buildings in the Northern Quarter business district. The government of Belgium wants to recreate Washington, D.C. on a small scale. 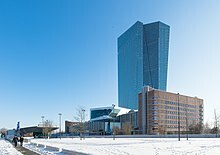 Frankfurt is currently the best known high-rise building city of Europe. Big skyscrapers dominate the city. In London, you can find them in Canary Wharf. In Paris, the counterpart of Canary Wharf is La Défense. Tower blocks were first built in the United Kingdom after the Second World War, and were seen as a cheap way to replace 19th-century urban slums and war-damaged buildings. They were originally seen as desirable, but quickly fell out of favour as tower blocks attracted rising crime and social disorder, particularly after the collapse of Ronan Point in 1968. Although Tower blocks are controversial and numerous examples have been demolished, many still remain in large cities. They present a significant fire risk, as modern safety precautions can be prohibitively expensive to retrofit. The destruction of the 24-storey Grenfell Tower in 2017 by fire had been complained about by a local action group several years before the incident, yet remedial work had not been carried out. In Dublin, the Ballymun Flats were built between 1966 and 1969: seven 15-story towers, nineteen 8-story blocks and ten 4-story blocks. These were the "seven towers" referred to in the U2 song "Running to Stand Still". They have since been demolished. Inner Dublin flat complexes include Sheriff Street (demolished), Fatima Mansions (demolished and redeveloped), St Joseph's Gardens (demolished; replaced by Killarney Court flat complex), St Teresa's Gardens, Dolphin House, Liberty House, St Michael's Estate and O'Devaney Gardens and a lot more mainly throughout the north and south inner city of Dublin. Suburban flat complexes were built exclusively on the northside of the city in Ballymun, Coolock and Kilbarrack. These flats were badly affected by a heroin epidemic that hit working-class areas of Dublin in the 1980s and early 90s. During the era of the Celtic Tiger the largest cities such as Dublin, Cork, Limerick and Galway witnessed new large apartment building, although their heights have generally been restricted. Some large towns such as Navan, Drogheda, Dundalk and Mullingar have also witnessed lots of modern apartment blocks being built. Tower blocks in Northern Ireland were never built to the frequency as in cities on the island of Great Britain. Most tower blocks and flat complexes are found in Belfast although many of these have been demolished since the 1990s and replaced with traditional public housing units. The mid-rise Divis flats complex in west Belfast was built in between 1968 and 1972. It was demolished in the early 1990s as the residents demanded new houses due to mounting problems with the flats. Divis Tower, built separately in 1966, still stands, however; and in 2007 work began to convert the former British Army base at the top two floors into new dwellings. Divis Tower was for several decades Ireland's tallest residential building, having since being surpassed by the privately owned Obel Tower in the city centre. In the north of the City, the iconic 7 towers complex in the New Lodge remains, although so too the problems that residents face, such as poor piping and limited sanitation. Farther north, the four tower blocks in Rathcoole dominate the local skyline, while in south Belfast, the tower blocks in Seymour Hill, Belvoir & Finaghy remain standing. Most of the aforementioned high rise flats in the city were built by the Northern Ireland Housing Trust (NIHT) as part of overspill housing schemes, the first such development being the pair of point blocks in East Belfast's Cregagh estate. These eleven-story towers were completed in 1961 and were the first tall council housing blocks on the island of Ireland. The NIHT also designed the inner city Divis Flats complex. The six to eight story deck access flats that comprised most of the Divis estate were of poor build quality and were all demolished by the early 1990s. Similar slab blocks were built by the NIHT in East Belfast (Tullycarnet) and Derry's Bogside area, all four of which have been demolished. Belfast Corporation constructed seven tower blocks on the former Victoria Barracks site in the New Lodge district. While the Corporation built some mid-rise flats as part of slum clearance schemes (most notably the now demolished Unity Flats and the 'Weetabix Flats in the Shankill area), New Lodge would be their only high rise project in the inner city with three more in outlying areas of the city during the 1960s, two being in Mount Vernon in North Belfast and one being in the Clarawood estate, East Belfast. The Royal Hospital built three thirteen-story towers for use as staff accommodation, prominently located adjacent to the M2 Motorway at Broadway. Belfast City Hospital also constructed a high rise slab block which since privatisation has been named Bradbury Court, formerly known as Erskine House. Queens University Belfast built several eleven storey towers at their Queens Elms student accommodation. Of the three sixteen-story point blocks of Larne Borough Council in the late 1960s, only one remains. In Canada, large multi-family buildings are usually known as apartment buildings or apartment blocks if they are rented from one common landowner, or condominiums or condo towers if each dwelling unit is individually owned; they may be called low-rise (or walk-up), mid-rise, high-rise, or skyscraper depending on their height. Tall residential towers are a staple building type in all large cities. Their relative prominence in Canadian cities varies substantially, however. In general, more populated cities have more high-rises than smaller cities, due to a relative the scarcity of land and a greater demand for housing. However, some cities such as Quebec City and Halifax have fewer high-rise buildings due to several factors: a focus on historic preservation, height restrictions, and lower growth rates. In middle-sized cities with a relatively low population density, such as Calgary, Edmonton, Winnipeg, or Hamilton, there are more apartment towers but they are greatly outnumbered by single-family houses. Most of the largest residential towers in Canada are found in Montreal, Toronto, and Vancouver—the country's most densely populated cities. Toronto contains the second largest concentration of high-rise apartment buildings in North America (after New York). In Canada, like in other New World countries, but unlike Western Europe, most high-rise towers are located in the city centre (or "downtown"), where smaller, older buildings were demolished to make way in redevelopment schemes. In the United States, tower blocks are commonly referred to as "midrise" or "highrise apartment buildings", depending on their height, while buildings that house fewer flats (apartments), or are not as tall as the tower blocks, are called "lowrise apartment buildings". Specifically, "midrise" buildings are as tall as the streets are wide, allowing 5 hours of sunlight on the street. Some of the first residential towers were the Castle Village towers in Manhattan, New York City, completed in 1939. Their cross-shaped design was copied in towers in Parkchester and Stuyvesant Town residential developments. The government's experiments in the 1960s and 70s to use high-rise apartments as a means of providing the housing solution for the poor broadly resulted in failure. Made in the tower in the park style, all but a few high-rise housing projects in the nation's largest cities, such as Cabrini–Green and Robert Taylor Homes in Chicago, Penn South in Manhattan, and the Desire projects in New Orleans, fell victim to the "ghettofication" and are now being torn down, renovated, or replaced. Another example is the former Pruitt–Igoe complex in St. Louis, torn down in the 1970s. In contrast to their public housing cousins, commercially developed high-rise apartment buildings continue to flourish in cities around the country largely due to high land prices and the housing boom of the 2000s. The Upper East Side in New York City, featuring high-rise apartments, is the wealthiest urban neighborhood in the United States. Currently, the tallest residential building in the world is 432 Park Avenue located in Midtown Manhattan, having a height of 1,396 feet with the highest occupied floor at 1,287 feet. High-rise living in Australia was limited to small pockets of bohemian inner Sydney until the 1960s, where a short-lived fashion saw public housing tenants located in new high-rise developments, especially in Sydney and Melbourne. The buildings pictured along with four other 16-story blocks were constructed on behalf of the Royal Australian Navy and were available to sailors and their families for accommodation. Due to social problems within these blocks the Navy left and the Department of Housing took charge and flats were let to low income and immigrant families. During the 1980s many people escaping communism in Eastern bloc countries were housed in these buildings. Developers have enthusiastically adopted the term "apartment" for these new high-rise blocks, perhaps to avoid the stigma still attached to housing commission flats. "Streets in the sky" redirects here. For the third studio album by UK rock band The Enemy, see Streets in the Sky. Streets in the sky is a style of architecture that emerged in Britain in the 1960s and 1970s. Generally built to replace run-down terraced housing, the new designs included not only modern improvements such as inside toilets, but also shops and other community facilities within high-rise blocks. Examples of the buildings and developments are Trellick Tower, Balfron Tower, Robin Hood Gardens and Keeling House in London, Hunslet Grange in Leeds and Park Hill, Sheffield. These were an attempt to develop a new architecture, differentiated from earlier large housing estates, such as Quarry Hill flats in Leeds. Alison and Peter Smithson were the architects of Robin Hood Gardens. Another large example, the Aylesbury Estate in South London, built in 1970, is about to be demolished. The Hulme Crescents in Manchester were the largest social housing scheme in Europe when built in 1972 but lasted just 22 years. The Crescents are recognised as one of the worst social housing schemes in British history, marred by design and practical problems; they severely challenged the viability of the Streets in the Sky ideal. Deck access is a type of flat that is accessed from a walkway that is open to the elements, as opposed to flats that are accessed from fully enclosed internal corridors. Deck access blocks of flats are usually fairly low-rise structures. The decks can vary from simple walkways, which may be covered or uncovered, to decks wide enough for small vehicles. The best known example of deck-access flats in the UK is Park Hill, Sheffield, where the decks are wide enough to allow electric vehicles; however, the design is inspired by French Modernist architect Le Corbusier, particularly his Unite D'Habitation in Marseilles. Salford tower blocks in 2001. In the UK, tower blocks were mostly built between the 1950s and 70s. Green tower blocks have some scheme of living plants or green roofs or solar panels on their roofs or incorporate other environmentally friendly design features. ^ "skyscraper". ©2012 Encyclopædia Britannica, Inc. Retrieved 19 September 2012. ^ Data Standards: high-rise building (ESN 18727), Emporis Standards. Accessed online 16 October 2009. ^ p. 57, Urban redevelopment: a study of high-rise buildings, K. Narayan Reddy, Concept Publishing Company, 1996, ISBN 81-7022-531-0. ^ Aldrete 2004, pp. 79f..
^ Aldrete 2004, p. 78. ^ Aldrete 2004, pp. 78–9. ^ Aldrete 2004, pp. 79 ff..
^ Emporis GmbH. "John Hancock Center, Chicago - 116876 - EMPORIS". emporis.com. ^ a b Sarah Williams Goldhagen (18 May 2012). "Sarah Williams Goldhagen on Architecture: Living High". New Republic. Retrieved 28 June 2012. ^ a b Meinhold, Bridgette (25 May 2012). "2012 Pritzker Prize Awarded to Wang Shu – First Chinese Architect to Win the Award". inhabitat.com. Retrieved 28 June 2012. ^ Minsuk Cho (2008). "Two Houses in Seoul". In Ilka and Andreas Ruby. Urban Trans Formation (PDF). Ruby Press. p. 25. Retrieved 28 June 2012. ^ Assoc Prof Nnamdi Elleh (28 November 2014). Reading the Architecture of the Underprivileged Classes. Ashgate Publishing, Ltd. pp. 212–. ISBN 978-1-4094-6786-1. ^ "Ronan Point". The Open University. Retrieved 29 October 2015. ^ Wahlquist, Calla (14 June 2017). "Fire safety concerns raised by Grenfell Tower residents in 2012". The Guardian. Retrieved 14 June 2017. ^ "RTÉ News: Demolition of famous Dublin tower block". www.rte.ie. 13 March 2005. Retrieved 19 May 2010. ^ Glendinning, Miles & Muthesius, Stefan (1994). Tower Block: Modern Public Housing in England, Scotland, Wales and Northern Ireland. London: Yale University Press. p. 288. ^ Glendinning, Miles & Muthesius, Stefan (1994). Tower Block: Modern Public Housing in England, Scotland, Wales and Northern Ireland. London: Yale University Press. p. 367. ^ "Avenues and Mid-Rise Buildings Study". City of Toronto. Retrieved 15 February 2016. ^ "INTERSECTION FIELDS III: Michiel Brinkman vs. Peter and Alison Smithson". www.hiddenarchitecture.net. Retrieved 25 November 2017. ^ "Streets in the Sky". Intute.ac.uk. 1 November 2006. Retrieved 8 August 2010. ^ "Social Engineering Through Architectural Change". Newenglishreview.org. Retrieved 8 August 2010. ^ "Alison and Peter Smithson, Design Museum". Designmuseum.org. Archived from the original on 24 November 2010. Retrieved 8 August 2010. ^ "Aylesbury Tenants First". Aylesbury Tenants First. Retrieved 8 August 2010. ^ BBC 'English Heritage' documentary about Park Hill flats. ^ "de beste bron van informatie over sustainingtowers. Deze website is te koop!". sustainingtowers.org. Retrieved 15 August 2012. ^ "Tower blocks go green with power-saving panels". Salford.gov.uk. 20 September 2010. Retrieved 25 November 2011. Aldrete, Gregory S. (2004). Daily Life in the Roman City: Rome, Pompeii and Ostia. ISBN 978-0-313-33174-9. Dunleavy, Patrick (1981). The politics of mass housing in Britain, 1945–1975. Oxford, U.K: Clarendon Press. Hanley, Lynsey (2007). Estates: an intimate history. London: Granta Books. Power, A. (1987). Property before people. London: Allen & Unwin. Power, A. (1997). Estates on the edge. Great Britain: MacMillan. Wikimedia Commons has media related to High-rises. This page was last edited on 13 March 2019, at 10:59 (UTC).